The controversial global seed giant sets out to woo social media mavens. Some consider Monsanto the epitome of evil, a greedy global corporation disrupting the food and farm chain for a higher profit margin. Monsanto-bashing on the Web is a popular sport; the most strident online critics refer to the company as Monsatan. History isn’t on Monsanto’s side: Founded in 1901, the multi-billion dollar Midwestern-based business has been behind such harmful chemicals as Agent Orange, Dioxin, DDT, and PCBs, the questionable dairy cow hormone rBGH, and the artificial sweetener Aspartame. Since the 1980s, Monsanto began retooling itself as an agricultural entity. Its first genetically modified product, the “Round-Up Ready” soybean, resistant to the herbicide glyphosate, has proven both a top seller and a significant headache for the company. Not to mention a vocal group of consumers who believe GMO foods are toxic and unsafe to eat. Many of them are fighting for GMO labeling laws. Monsanto, in return, has spent millions to defeat pro-labeling state bills and ballot measures. How to move the discussion along to more cheery subjects? 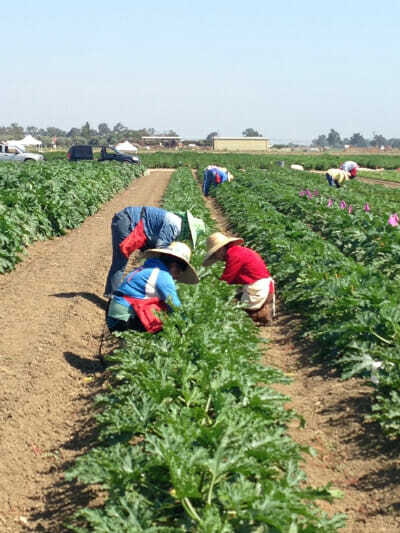 Slurping on watermelon slices straight from the field under a hot August sun isn’t a bad way to start. That’s exactly what took place at a recent social media event at Monsanto’s Woodland experimental research farm and facility, in the heart of Northern California’s ag belt. Mommy bloggers, science-minded social media types, and even a self-dubbed, anti-corporate, skeptical vegan, took a tour of the pesticide and produce company’s $31 million dollar, 89,000 square-foot R&D center. There, among the rows of experimental, hybrid and conventional crops, were Monsanto’s hat-wearing, knife-toting plant breeders. They each displayed a freshly picked crop, shared nuanced details about different varieties, and then sliced up the fruits of their labor for the guests. It was straight out of the Know Your Farmer, Know Your Food playbook. 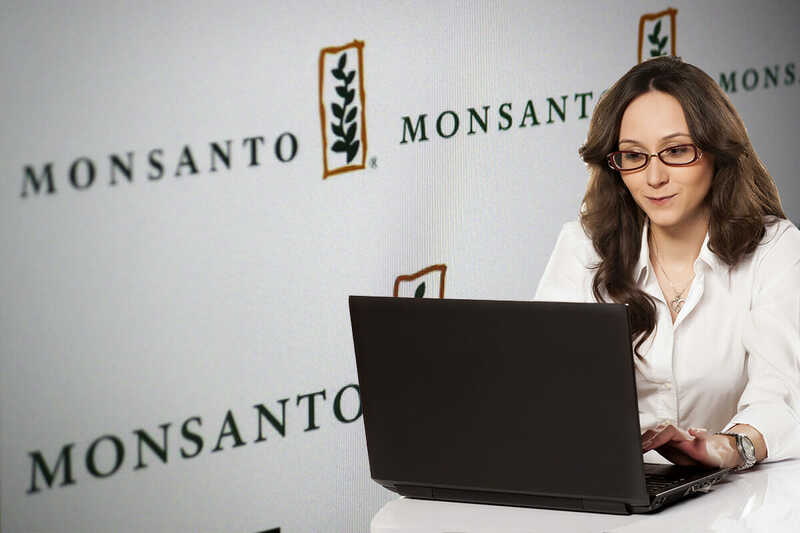 Also in the mix, two Monsanto execs from the company’s headquarters in St. Louis: Janice Person, online engagement entrepreneur, and Holly Butka, global consumer engagement director. These Midwestern moms with farm family backgrounds shepherded us around the fields in minivans. The pair talked as easily about raising teens and produce-centric recipes as they did about GMO crops and honeybee colony collapse. These Monsanto execs shepherded bloggers around the fields in minivans. The pair talked easily about raising teens and produce-centric recipes. Their mission is to convince us that Monsanto’s goal is to help feed a hungry planet — as opposed to maximizing profits at any cost. Case in point: Company man Robert Fraley, Monsanto’s chief technology officer, who shared the annual World Food Prize for his biotechnology work in 2013. In Lords of the Harvest, NPR science reporter Dan Charles portrays Fraley as a ruthless, intensely driven corporate henchman, more interested in industry dominance than solving world hunger (more on that in this piece from Australian science magazine Cosmos). Person and Butka would like to shift focus towards Fraley’s work to feed 9 billion people. Even organics were on the table. Monsanto plant breeder Tom Wofford, who gave an overview of veggie R&D, mentioned he grew up on a small farm in East Tennessee: “We were farming organic before there was organic. There was no choice,” says Wofford. “It was just how we lived.” Then Wofford moved on to talk of transgenic crops (aka GMOs) and marker breeding biotechnology. We picked up factoids in the field: Consumers in Brazil prefer their watermelons large, elongated and seeded. U.S. consumers prefer small, round, seedless varieties. The breeders shared their goals to develop seeds with longer post-harvest shelf lives. They also talked of futzing with a plant’s Brix level, that’s its sweetness scale or sugar content, to produce optimal fruit. Everyone nodded while watermelon juice dripped down their chins. What could possibly be wrong with such an outing? Plenty, according to food movement advocates. “Stealth marketing techniques, such as these by Monsanto, reveal how the food industry – from biotech behemoths to fast-food peddlers – is working surreptitiously to shape public opinion about biotechnology, industrialized farming and junk food,” wrote author and activist Anna Lappé in an article for Al Jazeera America. It’s not the first event of its kind. Following the annual BlogHer Conference, held in San Jose this year, two female farmers and Monsanto reps hosted a brunch for bloggers. At least one BlogHer attendee gave Person a platform in a Q&A post. And a 2013 BlogHer post entitled “Listening to the Women of Monsanto,” offered a forum for Person, a pair of Monsanto scientists, and a director of corporate strategy. 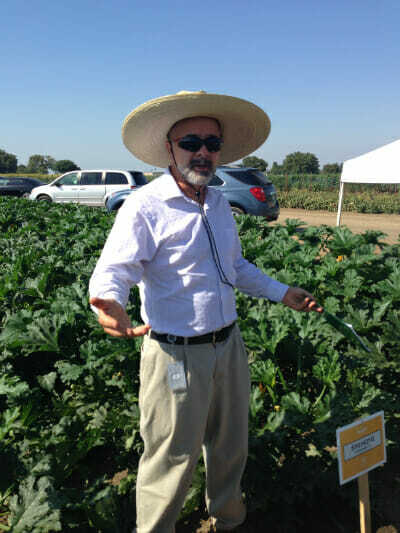 Monsanto squash breeder, Bill Johnson. One of Monsanto's research fields. 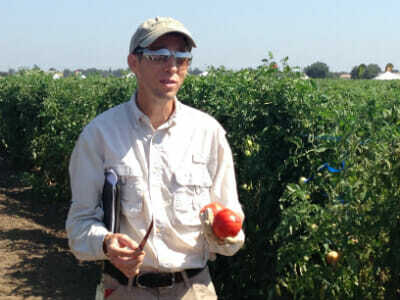 Monsanto tomato breeder, Alan Krivanek. Monsanto is the world’s largest seed company. They produce seeds for more than 20 crops, 4,000 varieties, and are sold in more than 160 countries. They boast 55 research-breeding stations around the globe. In the GMO realm, eight crops are approved in the United States: alfalfa, canola, corn, cotton, papaya, soybean, sugar beets, and squash. Monsanto dominates the market on two counts: It controls 80 percent of the seed market for GM corn and 93 percent of the GM soy seed market, according to Food and Water Watch. In the face of fierce opposition to such products, Monsanto is attempting to telegraph its new, non-GMO produce initiatives. Case in point: a recent Wired article titled “Monsanto Is Going Organic in the Quest for the Perfect Veggie.” Monsanto is also funding a Condé Nast Media Group film series titled “A Seat at the Table.” These short spots are slated to cover such ground as “Hunger: Feeding the Global Appetite” and “Nutrition: Fortifying Foods for a Modern World.” The company has raised eyebrows with its strategy of approaching high-profile food movement types, including Marion Nestle, to appear in episodes. The global seed giant also hit up others with brand recognition, such as NPR’s Mo Rocca and filmmaker Lori Silverbrush, wife of anti-GMO chef Tom Colicchio. All declined the opportunity. “Monsanto…is working surreptitiously to shape public opinion about biotechnology, industrialized farming and junk food,” wrote Anna Lappé. It’s hard to say whether the event equals a win for Monsanto or not, given the range of responses. But, as the old saw goes, there’s no such thing as bad publicity. Full disclosure: Participants at the Monsanto event received a $150 honorarium (this writer donated hers to charity) and an infusion water bottle sporting the Monsanto logo. Oh, and there was that free buffet lunch.